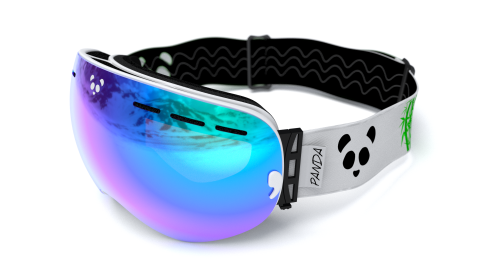 British ski goggle company, Panda Optics, launched in 2014 with a frameless and semi-frameless Polarised goggle that combines the very latest technology with innovative design. There are two main designs Diablo, which is semi-frameless, and, Funnel, which is fully frameless, and both deflect snow away from the lens and prevents any build up. Every pair of goggles comes with a low light HD lens. Although polarised lenses will be perfect for most conditions when it is a complete white-out or extremely flat light PANDAS provide the very best vision for the conditions. Lenses have Guma® integrated technology and quick change lens systems on both the Funnel and Diablo range make swapping from your polarised lenses to the low light HD lenses quick and easy. “As I’m sure you know, there is a delicate balance with goggles (and ski equipment in general) between quality and production cost. We have spent 3 years researching a number of aspects such as frame material, straps and grip, lens changing technology, anti-fog technology, helmet compatibility, low light vision…. and most importantly the production and value of polarised lenses”.